The Getaria GE-ME-LEF-319 effects pedal offers 2 Working Modes: Hard/Soft. Hard: Provide hard effect of noise reduction. Soft: Provide soft effect of noise reduction. 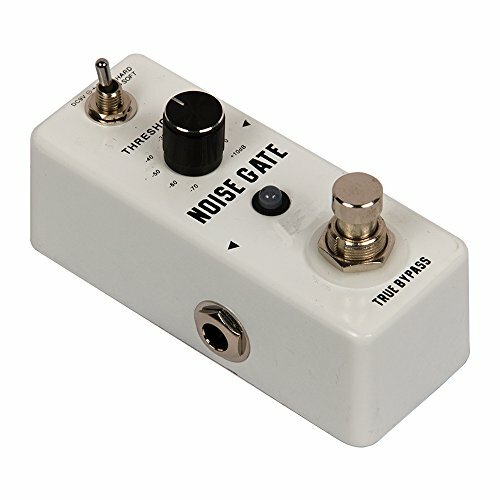 Its full metal casing makes it very small and exquisite, and like most great effects pedals it has true bypass. 1. Do not use the pedal in high temperature, high humidity, or subzero environments. 2. Do not use the pedal in the direct sunlight. 3. Please do not dissemble the pedal by yourself. 4. Please keep the manual for future reference. Two models.Hard Mode: Provide hard effect of noise reduction, Soft Mode: Provide soft effect of noise reduction.